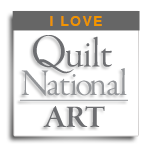 This is the title of one of the most influential books I used early in my quilting history. It's by Lee Cleland, and if you haven't seen it, you should. It will transform you. 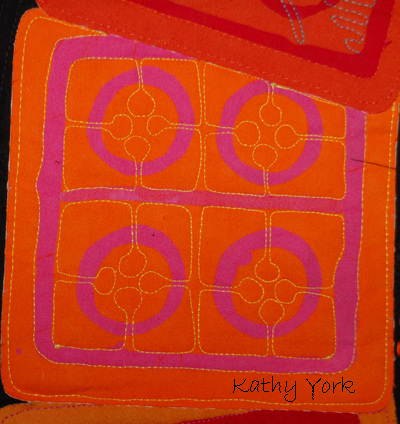 One quilt pattern was replicated and quilted differently by 4 or 5 different people. It is surprising and wonderful! 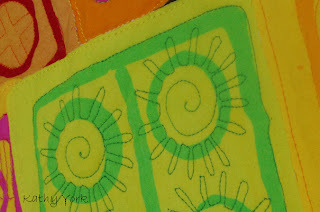 So when I design a quilt, the design of the quilting lines plays a prominent role. It's another layer of design that can truly enhance your quilt or merely hold it together. 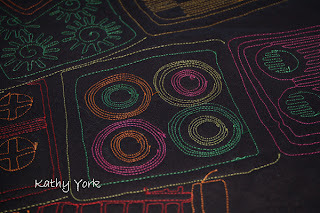 I am often stumped at this point and will take a number of ideas to try out, and draw on a photo, or put tracing paper on the quilt and try out some different designs. For example, see the blocks below. 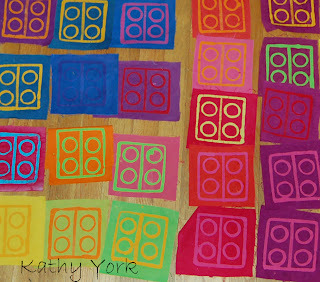 Each of the blocks is a different color but essentially it is one design theme. How to quilt them? 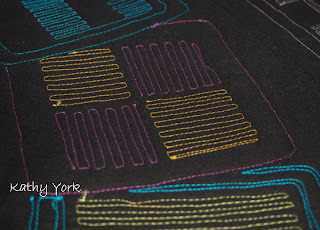 That's when I decided to experiment using a different quilting pattern with each block, and a different set of threads. (Don't forget to click on the pictures if you want a closer view.) 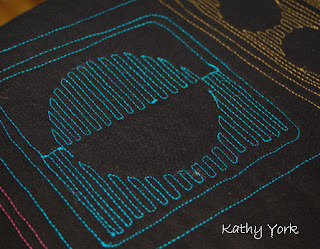 I don't mind changing thread colors, and I have lots of lots of wonderful colors from Superior Threads. 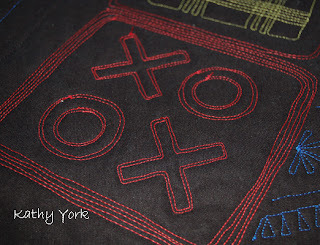 I also don't mind quilting patterns that have a lot of stops and starts, which is probably a good thing because it allows me to be freer in my design decisions. If you were drawing a picture with a box of crayons, would you limit yourself to only one color, and picking up and putting down your crayon only once?? Not a perfect analogy because crayons are much easier to change than thread, but you get the idea. I had a great time with this project because it never became repetitive and boring. It was a fun challenge to do the over 70 blocks each with a different design. 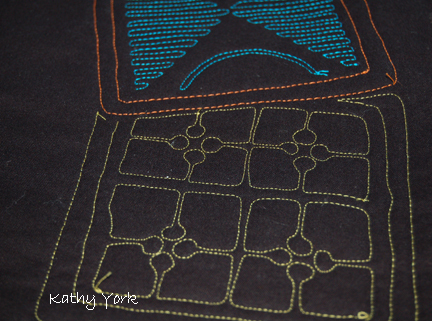 And because I used black fabric on the back, you can really see the quilting designs and color choices. 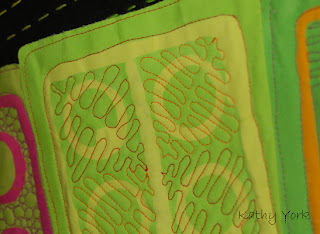 And on the front, regardless of the quilting design, or thread color, it still makes a much more subtle look to the work than you might have anticipated, especially from a distance. But step up close...and WOW! It adds a new dimension that is fabulous and engaging! I hope that if you are still stippling or stitching in the ditch with matching thread, you will be inspired to try something new! Fantastic, I love the colours and the different quilting designs, as always inspirational! 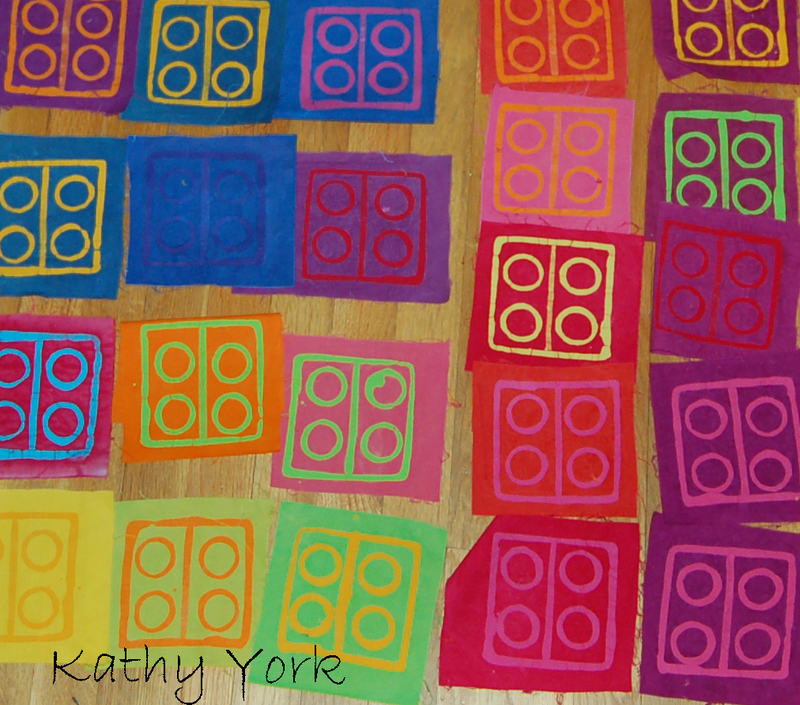 I love the designs on each block as they really make the blocks and the quilt stand out. It's very inspiring. I do have a copy of Lee Cleland's book and also think it's great. Thanks for sharing. 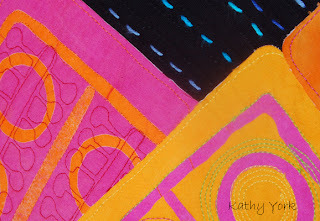 I do tend to sticth-in-the-ditch and hide my quilting but this post just might be what I needed to inspire me to work outside of my comfort zone. 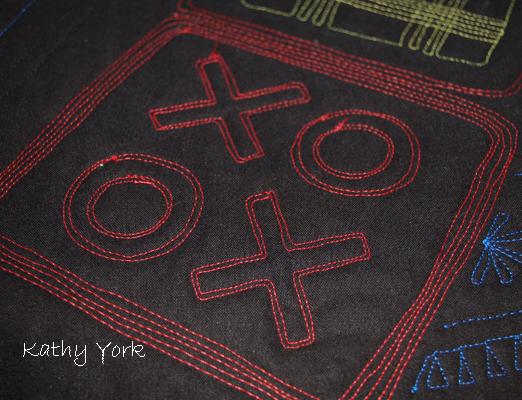 I started quilting with stitch in the ditch too, with matching thread. And there may be some projects where that is a good choice. However, there are also many, many alternatives. Best advice, start small, try something new, and expect to be surprised! This looks so fun! It's sometimes hard for me to come up with quilting designs, I'm in awe that you were able to for this many blocks. The back looks as good as the front. 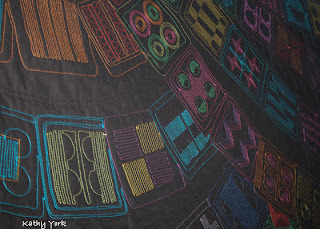 I think this was a fantastic way to quilt this and totally in keeping with the spirit of the piece. But how in the world did you think of 70 different designs? Kudos to you!!! Thanks Vivien! I didn't think of that many to start with, just a few. As I worked, I thought of a few more. It was a process. 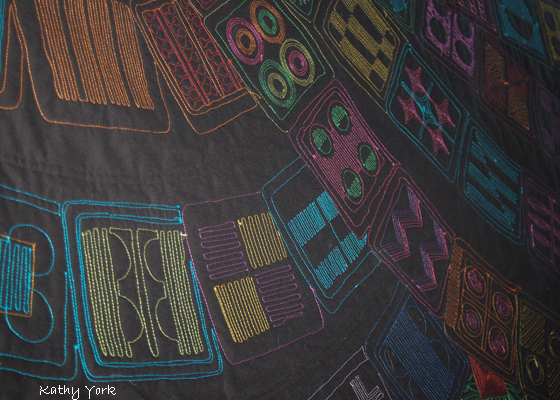 The quilt is about suburbs, and how all the houses can look the same. I wanted to carve out the individuality of each house with different colors and different patterns. So, it was really more than an experiment in quilting, it was part of what the quilt meant to me. That was really fun, thanks for sharing that. I love it. I'm afraid that I fall into the slot of quilting just to hold the layers together. You've inspired me to try to be more inventive. Thanks. What a beautiful piece - love the colors and design - unexpectected is the word that comes to mind. Great job! 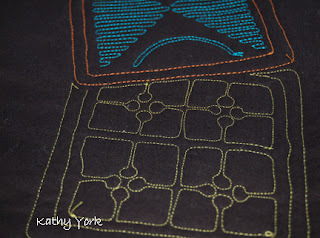 I tend to spend too much time worrying about whether I'm choosing the right quilting design, but I should just loosen up. When a deadline is looming, I just go for it, and end up loving the results. 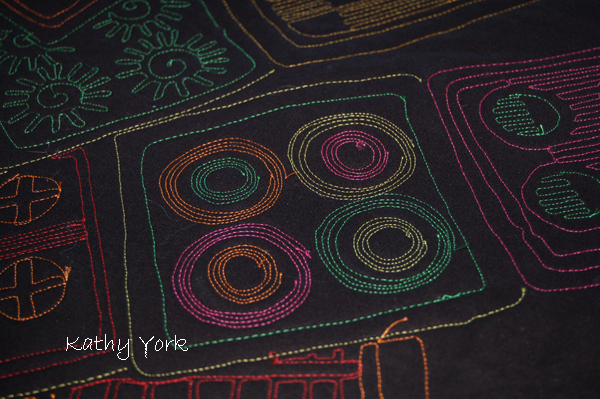 I usually try out designs on tracing paper first and lay them on top of the quilt. Or sometimes I make small samples to get an idea. But, like you, once I start, it usually works out fine. The hard part is starting. I tracked back from your Houston entry, and want to say how much I LOVE this quilt! 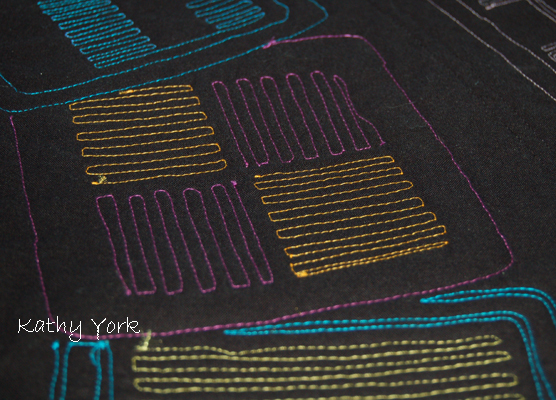 It's this individual quilting that doesn't show up much in pictures, but which makes the quilt. Unity, variety, rhythm...it's got it all! Wow Kathy! You never cease to amaze! I will look for the book! 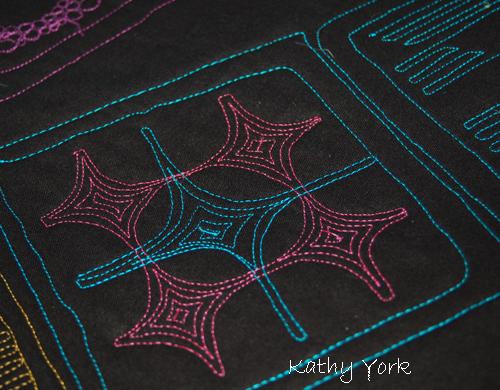 When I first learned about auilting I was very lucky to have discovered the Kemshall's book and their quilting designs are so inspiring! I love everything about this post, as well as the comments. This is such a special quilt!